The Copley HCP5 High Capacity Vacuum Pump provides consistent high capacity needed to accommodate higher, sonic flow rate testing. This vacuum pump features two inlets, one regulated and one unregulated to let users choose a metered flow rate or to bypass the flow control valve for a maximum flow rate of 416 L/min, or even connect a second HCP5 in parallel for a max unregulated flow rate of 833 L/Min. 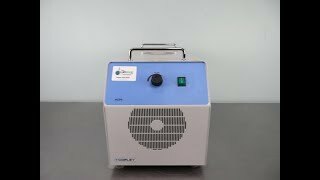 This high capacity Vacuum Pump is an ideal choice for applications involving the testing of of MDIs, DPIs, nebulizers, and nasal sprays. This low maintenance rotary vane pump is oil free and low noise being encased in acoustic lining and vibration dampening housing. This Copley HCP5 High Capacity Vacuum Pump has been fully inspected and pulled down to 51mbar. All of our lab equipment comes backed with our standard warranty. Should you have any questions, please don't hesitate to contact us.